The 4.25 patch for Final Fantasy XIV dropped today, adding the FFIII-inspired Forbidden Land of Eureka area to the game. It’s a magical island where players can group together and kill large numbers of creatures for very little reward until they fall asleep at the keyboard. 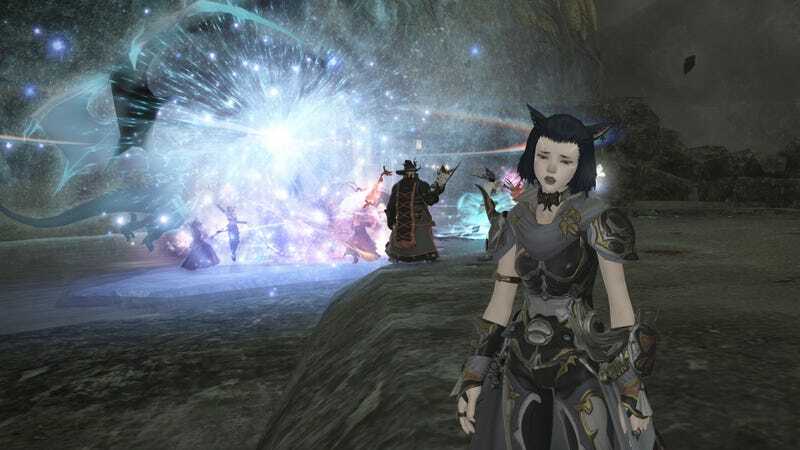 Announced back in 2016 with the Stormblood expansion and delayed several times over the past year and change, Eureka is a zone where players can grind for powerful gear. Grind is the operative term here. Once players complete the short introductory quest opening up the new area, it’s all about killing as many enemies as possible in order to collect crystals needed to create and upgrade powerful new gear. There are no sidequests. No special events, save the occasional spawning of a powerful creature requiring a large group of players to take it down. It’s kill, kill, kill, kill, fall asleep, wake up, kill some more. Eureka is a large map filled with enemies to kill and not much else. Players battle to increase their elemental experience level, a special Eureka-only progression mechanic, allowing them to fight more challenging enemies and maybe gather those crystals required for the new powerful equipment just a bit faster. But nothing about Eureka feels particularly fast. After a half hour of trying to battle enemies on my own, I’d made little progress towards the second elemental experience level. The creatures here are tough, encouraging players to team up, but they are not tough in an interesting way. They’ve got more hit points and they hit harder. They don’t employ advanced tactics or require any sort of special strategy. It’s just form a party, start zerging. I don’t mind a grind now and then, but it has to have something interesting about it to keep my attention. Eureka introduces an elemental affinity mechanic, allowing players to spend points to increase either their resistance or damage done to creatures of similar or opposing elements. That sounded interesting, but in practice it feels like an unnecessary complication. Having to swap your elemental affinity to fire to do more damage to an ice-aligned creature doesn’t make a tedious battle any less tedious. So yeah, this is not fun at all, and tons of players on the game’s Reddit and official forums agree. There are plenty of fun things to do in Final Fantasy XIV. The Forbidden Land of Eureka is not one of them.